The United States Congress designated the North Black Rock Range Wilderness (map) in 2000 and it now has a total of 30,648 acres. All of this wilderness is located in Nevada and is managed by the Bureau of Land Management. The Wilderness contains the northern portion of the Black Rock Range. Elevations in the Wilderness range from 4,800 to 8,400 feet. 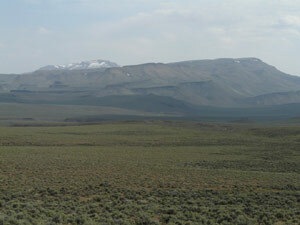 The dominant vegetation is sagebrush. Colman, Snow, Battle and Slumgullion Creeks also contain willows, cottonwoods, aspens and other riparian species. The headwaters of Colman Creek contain interesting rock formations and several small waterfalls. Colman and Battle Creeks contain reintroduced populations of the threatened Lahontan Cutthroat Trout. Other wildlife in the area include California bighorn sheep, mule deer, pronghorn antelope, mountain lions, coyotes, and sagegrouse. Planning to Visit the North Black Rock Range Wilderness? How to follow the seven standard Leave No Trace principles differs in different parts of the country (desert vs. Rocky Mountains). Click on any of the principles listed below to learn more about how they apply in the North Black Rock Range Wilderness.